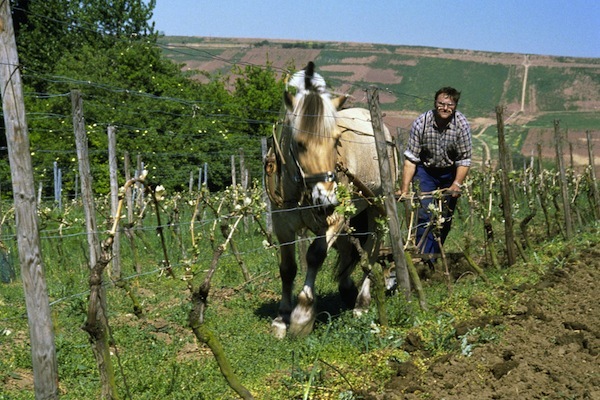 If you’re a wine lover (and I assume you are if you are reading these pages) this has probably happened to you: you travel to some far-flung locale, sample great wines, and want to bring some back. Once upon a time, of course, you could simply bring a few bottles on the plane in your carry-on. But those days are long gone. Now, you can’t bring a bottle of liquid more than 3 ounces on board. What do you do? From my many years as a foreign correspondent with trips as far afield as Australia, I knew the basic strategies: wrapping bottles in clothes to pad them, or putting them in some special wine padding like the Wine Skin or the Wine Diaper, or just using bubble wrap and tape. But that is risky, as the bottles can break. And it takes up a lot of luggage space; you’d be hard pressed to carry more than, say, 2-3 bottles. Most of all, it risks incurring excess baggage fees due to the increased weight. 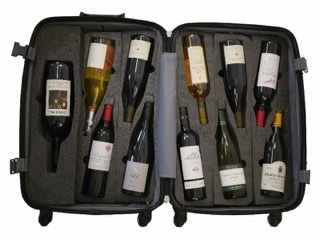 Fortunately wine luggage has come on the market for the post-9/11 security age. There are now bags you can drop with the airline as checked luggage with the reasonable assurance that your bottles – even a full 12-bottle case – will arrive with contents intact. There are soft-sided bags, suitcases, even heavy metal cases. On recent trips, I used two of leading products: the VinGarde Valise and the WineCheck. While both have the same purpose, they are markedly different products, each with pluses and minuses. 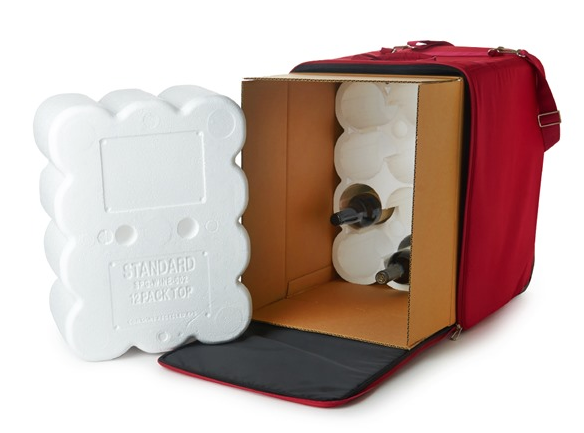 The Wine Check is essentially a soft-sided bag in which you stick a whole, empty wine shipping carton with its Styrofoam inserts. 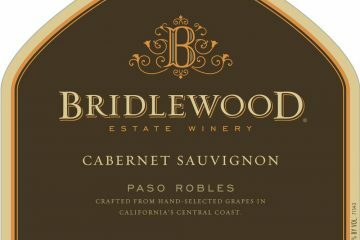 (You can get the box through the winery where you are buying the wine, or a wine shop, or directly from WineCheck.) You fill it up, tape it closed (I use fiber or strapping tape), and then zip the case closed and lock it if you want (with a TSA-approved lock of course). Check it as luggage and you are on your way. There are two wheels for rolling, but only a strap for pulling it, which makes it inconvenient for tall people (like myself) and awkward going for everyone. However, the company recently put out a Wine Check Elite, which has a telescoping handle – a great improvement. The main advantage of the Wine Check is weight. It is less than 5 lbs. empty, so even fully loaded it will not exceed most domestic or international checked baggage weight restrictions. It’s also economical: $75 for the standard model ($67.00 if you get your own shipping box). And it folds up into your suitcase to be filled up at your destination. The Elite model is $119 without the shipper box insert, $127 with it. Remember that it is a padded canvas case holding a wine shipping carton. It can take punishment, but I wouldn’t go tossing it around unduly. And the bottle sizes have to be pretty uniform depending on the shipping carton used – no magnums or mixing Champagne with riesling and Bordeaux unless you can find the right box. I traveled to Burgundy with the original 12-bottle Wine Check. Moving it on and off trains was sometimes difficult, especially with other bags in tow, as I made my way to from Paris to Beaune and back via train. But I filled it up with a dozen Burgundian treasures, and all made it back intact. The VinGarde Valise is a different animal. It is an actual polycarbonate-shell suitcase. It has foam inserts which snugly cradle 12 bottles, which are in turn then covered with an additional foam sheet on top. 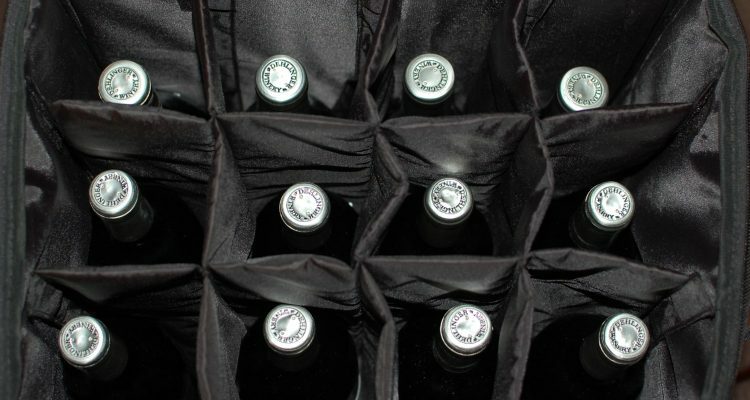 The inserts can be configured for different-shaped bottles, so your packed Burgundy, Bordeaux, and Champagne can coexist. There are also different configurations available, such as a magnum-sized insert and wine glass inserts. The suitcase then zips closed and can be locked. There are also two snap-close reinforcing straps. The big advantage here is that this is a true spinner suitcase, with four solid wheels and a telescoping handle. It is a joy to maneuver in airports or train stations. It was easy to move around with one suitcase, one VinGarde Valise, and a carryon. And it is sturdy. However, there are few caveats. It is heavier than the Wine Check, naturally, because it is an actual piece of luggage. The company says, “Depending on your bottle selection, even when fully loaded, the 12-bottle VinGardeValise Grande weighs less than 50 pounds, which means no overweight luggage fees!” Note the proviso is the bottle selection. Magnums and champagne bottles naturally weigh more, so you might run into weight issues, depending on the airline. However, it seems to be OK on international flights, where some airlines have better weight limits than on domestic routes. The Petite model holds 8 bottles and, fully loaded, is about 20 lbs. lighter than its big brother. The zippers can be a bit awkward, and the hinges could be better. The restraining straps on the outside are not affixed to the case, so they can easily come off and get lost during baggage handling. But owner Barry Wax says improvements are in the works that will address those issues. Some people will take issue with the price. The 12-bottle model, the Grande, is $269.99, and the 8-bottle Petite is $199.99. I recently traveled to the London Wine Show with my 12-bottle Grande. It was a dream to haul around. Coming back to the US I packed it with liquid goodies and checked it. Every item was fully intact, even though the bag had been opened by TSA (there was a note in it to that effect). However, the restraining straps went missing during transport. Barry Wax (who was in attendance at the London show) said the straps will be affixed to the bag on the newer models so they won’t go missing in transit. It was a close enough to the weight limit that the airline did not bother about it, but that is something to monitor. I can unhesitatingly recommend both the Wine Check and the VinGarde Valise to get your precious acquisitions home intact. For value and weight, I’d go with the Wine Check. If you have any mobility, height, or back issues, spend the extra money for the Wine Check Elite with the telescoping handle. It’s the good economical choice. For ease of use and durability, spring for the Vin Garde Valise. It’s more expensive, sure, but the convenience of being a 4-wheel spinner suitcase is big plus – much easier to schlep around airports and train stations. It’s also more versatile: in addition to the different bottle inserts, you can fit extra clothes or other breakable non-wine items in it if it’s not full. If you’re worried about weight, though, and don’t plan on acquiring a full case during your travels (if you can resist temptation), I recommend you buy the 8-bottle Petite model. Whatever you decide, please note that it is your responsibility to know the relevant airline, government, and customs policies/regulations governing the transport of wine and other alcoholic beverages. Bon voyage!